…That reason, teamed with a resolution to go to more design events, gave me a perfect excuse to attend OFFF festival in Barcelona. 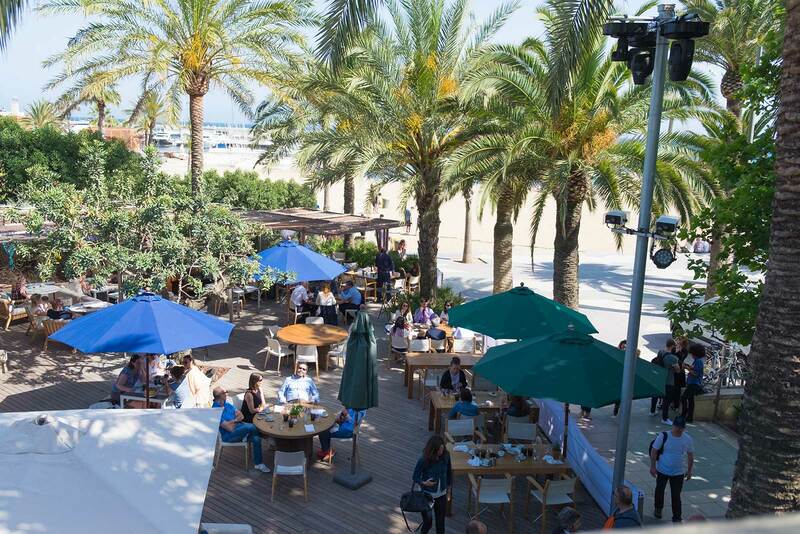 The festival ran for 3 days and was a mix of talks, events and workshops — spanning most of the creative sector from film, to illustration, to music. It was so inspiring listening to designers’ processes and approaches, the stories of both highs and lows, and also realising that it’s just real people (like you and I) that stand behind some of the most successful agencies in the industry. There’s hope for me to take on the world yet! I think revisiting a city for a second time is always so much different to the first. We already had our bearings and knew our favourite areas so we’d plotted an area on map for where our Airbnb hunt began. Staying in the El Born district, we were greeted at the station then climbed 91 steps (not welcomed after several sangrias!!) to our 5th floor apartment. 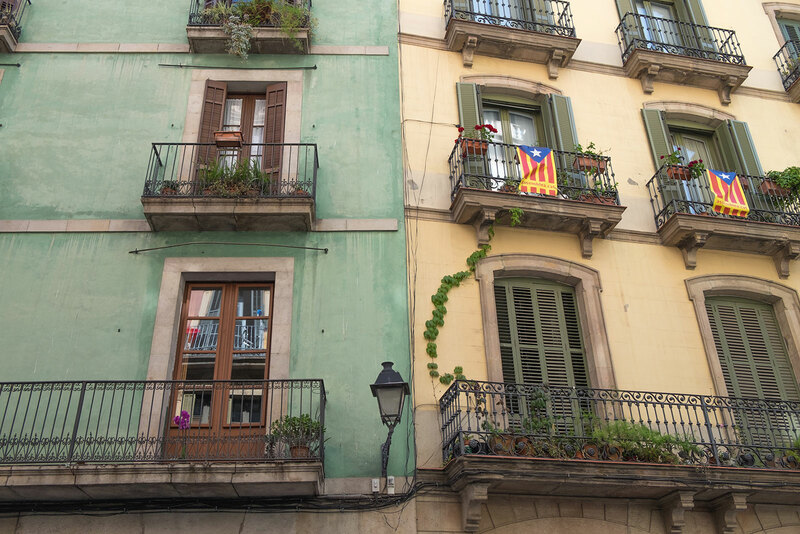 The building was beautiful and although it was renovated it did keep its traditional charm with original Catalan tiled floors and wrought iron Juliette balconies, perfect for gazing down at the street below. 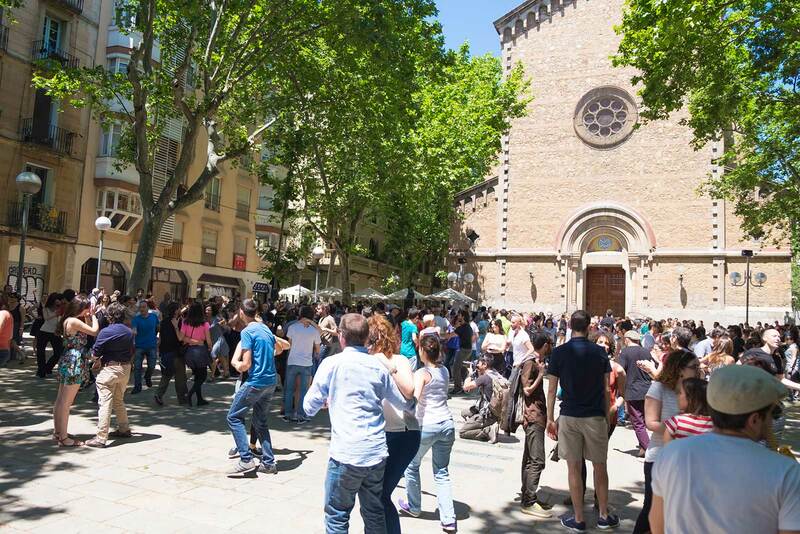 El Born is probably Barcelona’s most bohemian area with it’s designer boutiques, antique shops and independent eateries. 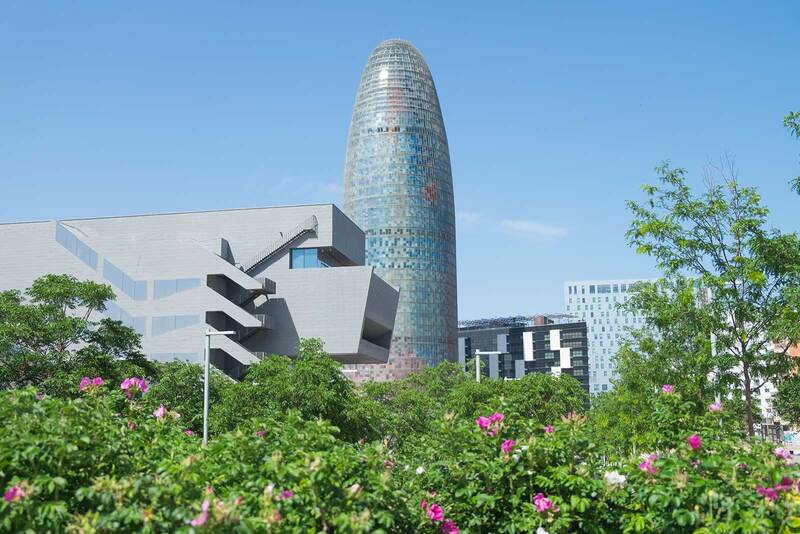 With a colourful art history, there’s now dozens of galleries and we stayed just 500 metres from the Picasso museum. That said, as we were in the city for the design festival it meant all of our down-time was spent weaving through the winding streets admiring the outsides of the galleries as opposed to the insides of them. Most of the district is pedestrianised which makes it perfect for aimlessly roaming too. 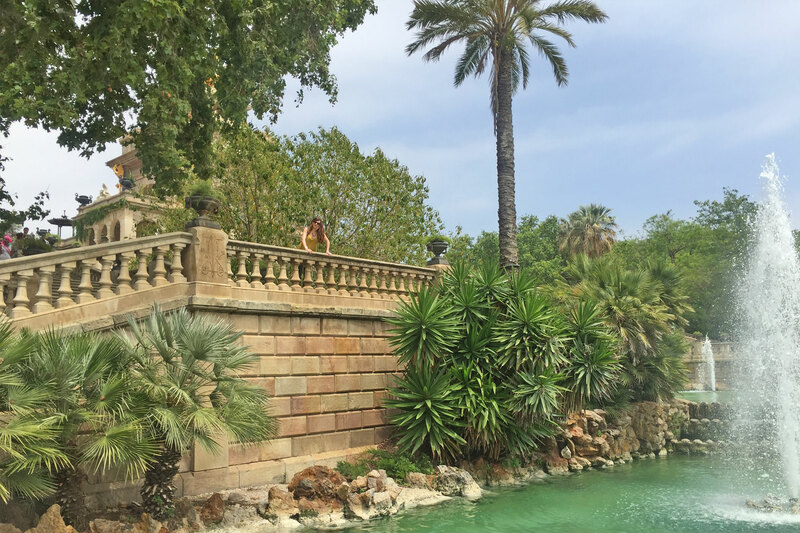 Just a few mins from our apartment was the lush Ciutadella Park — a bit of urban escapism, space and SUNSHINE after strolling through the relatively shaded streets of El Born. 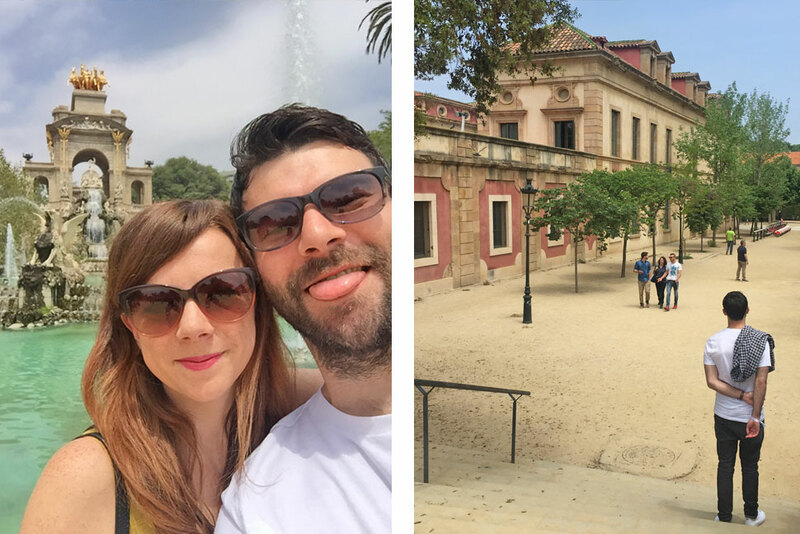 I think you can rent a boat from the lake and it’s also home to Barcelona Zoo which alas we didn’t get a chance to visit, but maybe next time! The Gothic Quarter was also just a few mins walk from where we stayed. 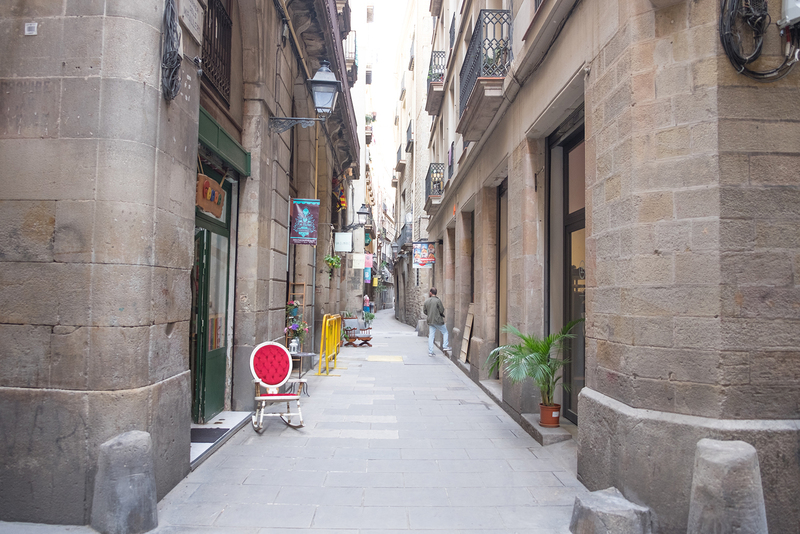 It’s the oldest part of the city and a bit of a go-to place for tourists… lots of people and lots of souvenir shops, but it’s fun to explore the labyrinthe of passages. 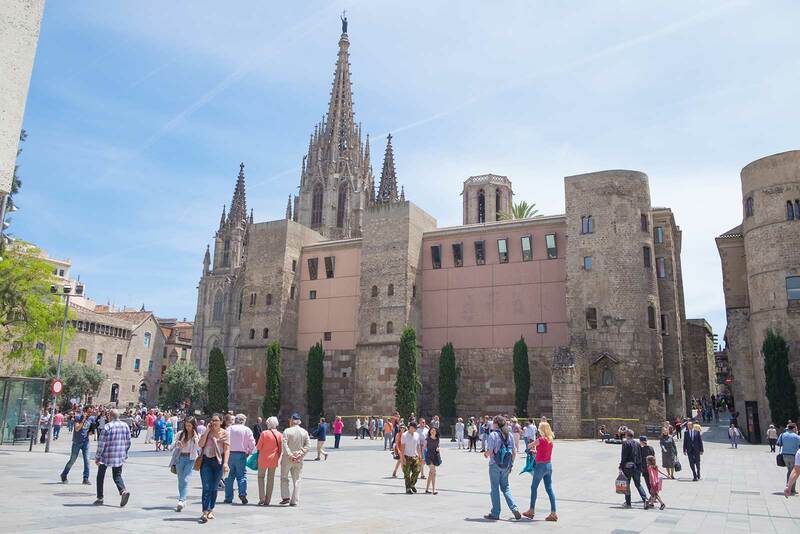 The main attraction is the Cathedral of Santa Eulalia, a perfect starting point to get lost in the medieval walls whilst eating ice cream! The Gothic Quarter is very atmospheric with its maze of alleyways and intimate squares. 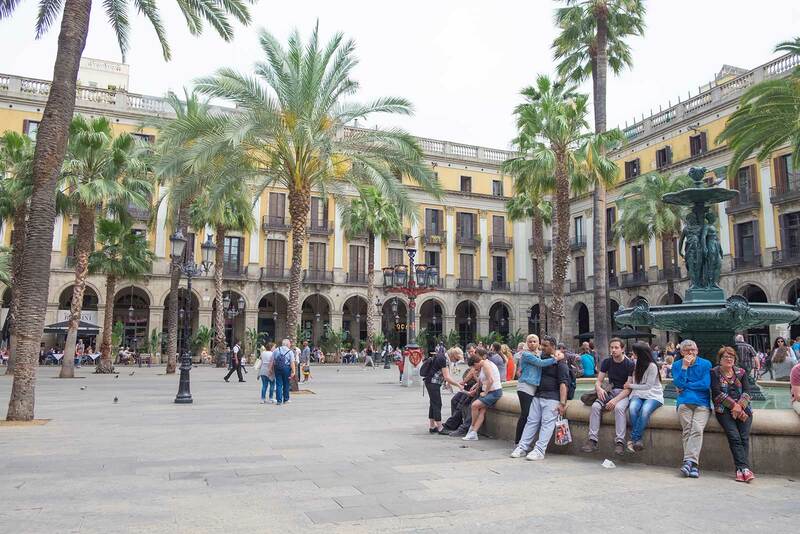 Placa Reial is my favourite — totally hidden from the nearby streets and you enter through arches, welcomed by big beautiful palm trees and fountains. 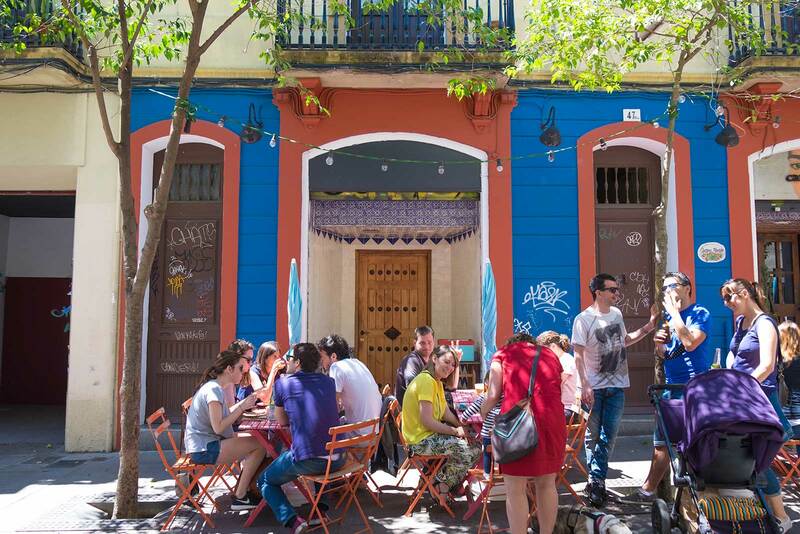 There’s some fancy restaurants and a boutique hotel but we took a pit stop outside the most casual (but trendy) looking place called Ocana to sip sangria and watch the street performers. Gotta love a bit of people watching! 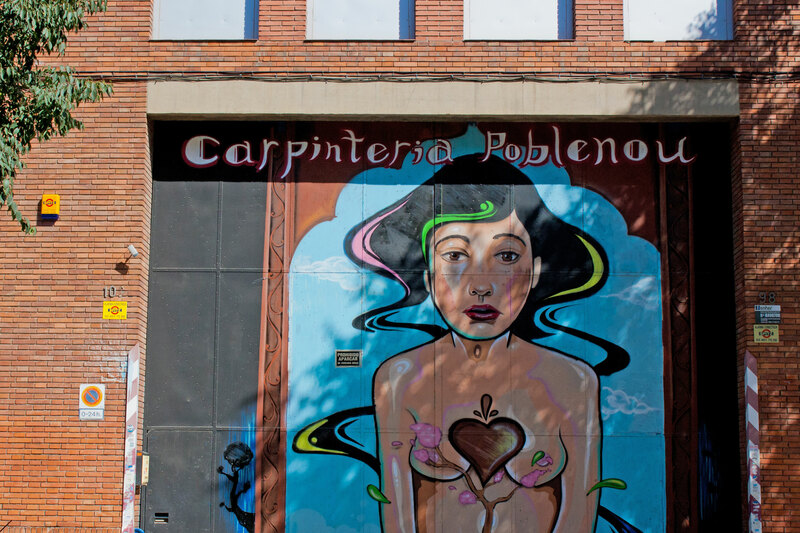 El Raval is a cool area. 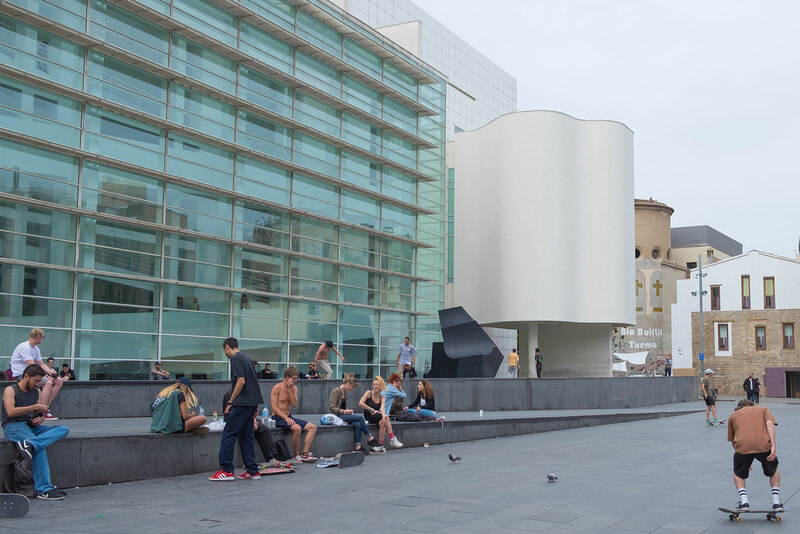 It’s slowly losing its seedy reputation and is home to the MACBA (Barcelona Museum of Contemporary Art) making it a catalyst for arts and culture. It’s also a hot spot for the city’s skateboarding scene. 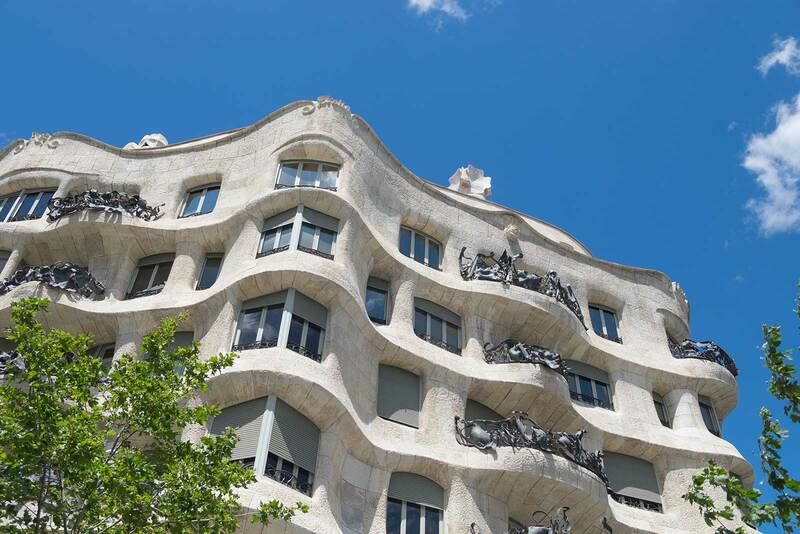 The L’Eixample neighbourhood needs no introduction because the Modernista showcase is home to some of Gaudi’s most famous pieces of work. It’s classed as the ‘new city’ with its tree-lined avenues built upon grids… but I still prefer the old town! 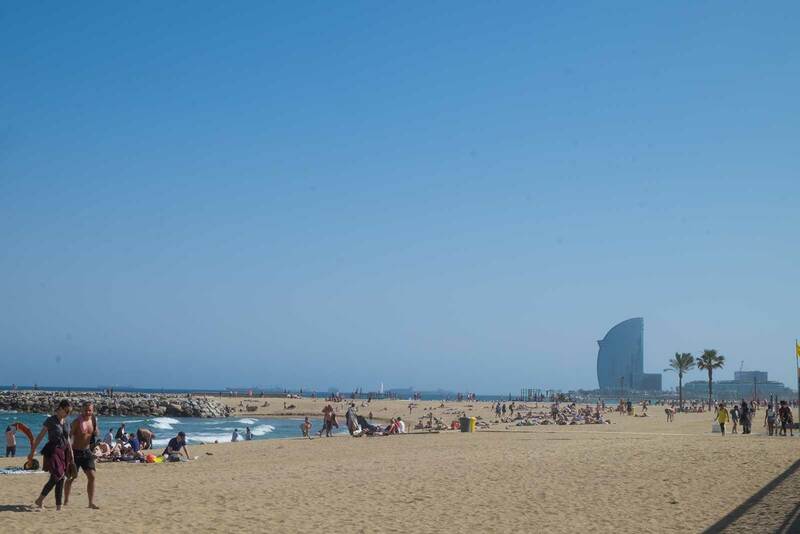 The thing I love most about Barcelona is that it’s a glorious city AND it has 4km of beautiful beaches. 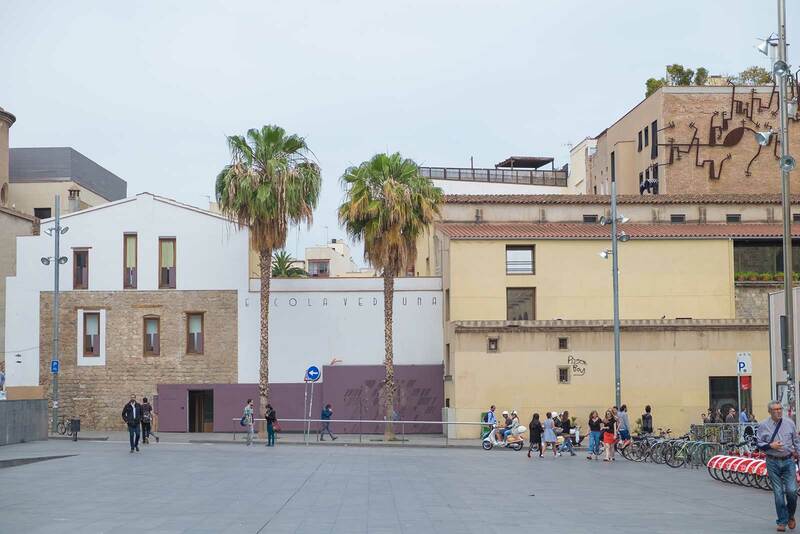 A stroll down Barceloneta’s boardwalk and you’ll see runners, skaters, dog walkers, surfers, street sellers, volleyball players… There’s a great selection of yummy seafood restaurants too. I could eat prawns every day. 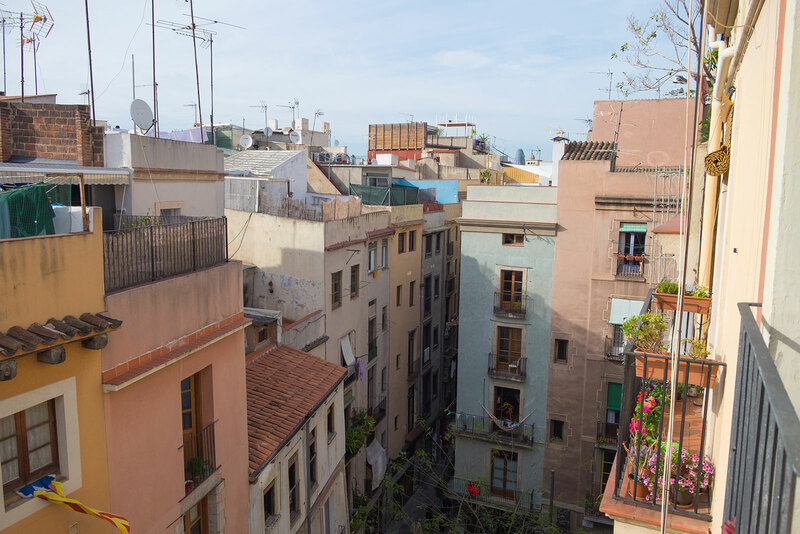 Barceloneta is an old fishing quarter and you still get a sense of it’s village feel when you explore the back streets. 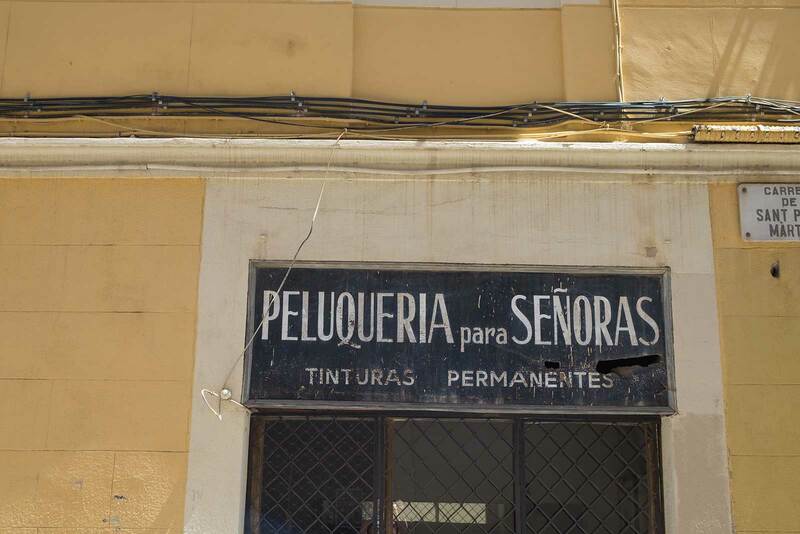 I loved seeing all the old women hanging their washing out on the balconies and the old dudes sitting outside their front door playing card games. If only I knew how to play properly… and speak Catalan… I’d have asked them for a game! 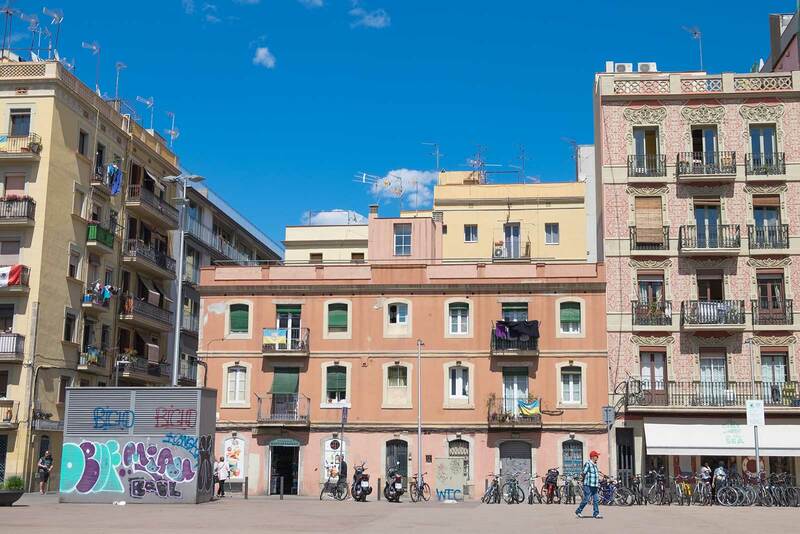 A little further past Barceloneta is Poblenou, a real, working class neighbourhood with a nice local feel. Factories and warehouses are now being turned into artists spaces as young creatives are being priced out the city, similar to that of East London I imagine. It feels a much slower pace round here, but it’s quirky with its concept stores and casual restaurants. 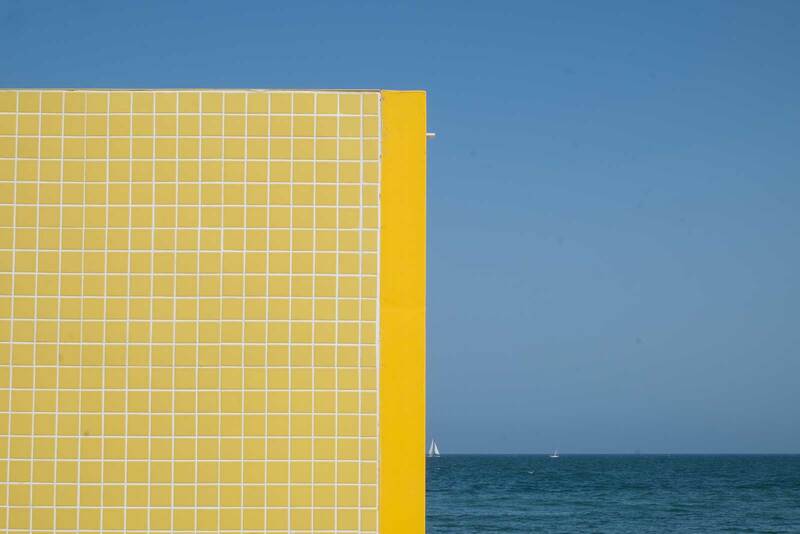 Our whole trip was centered around OFFF festival which was hosted in the Museu del Disseny (Design Museum), in Glories — a short walk from Poblenou. 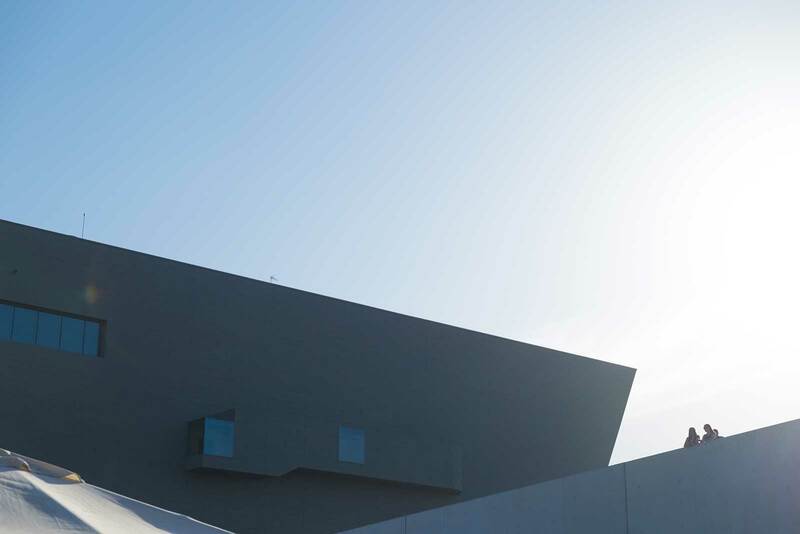 The huge space holds a library dedicated to the world of design as well as curated exhibitions and events like ours. 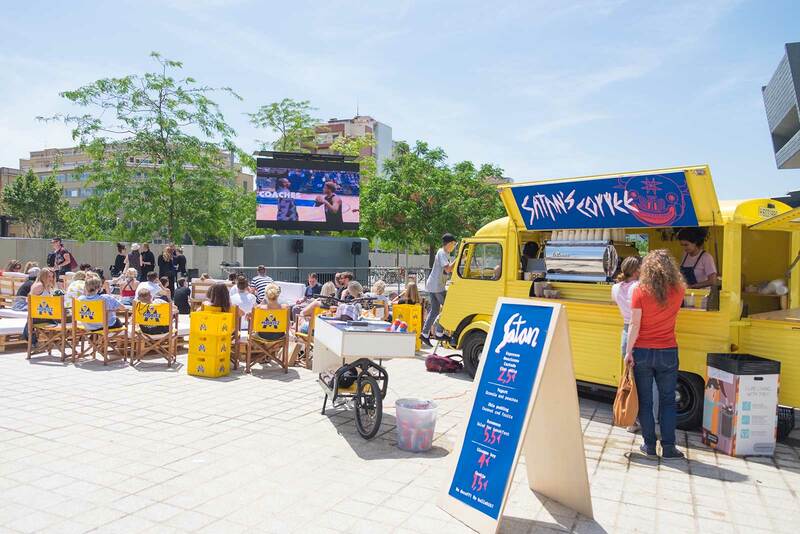 A much welcomed beer stand, coffee van and big screen were set up outside too — hurrah. A great venue. 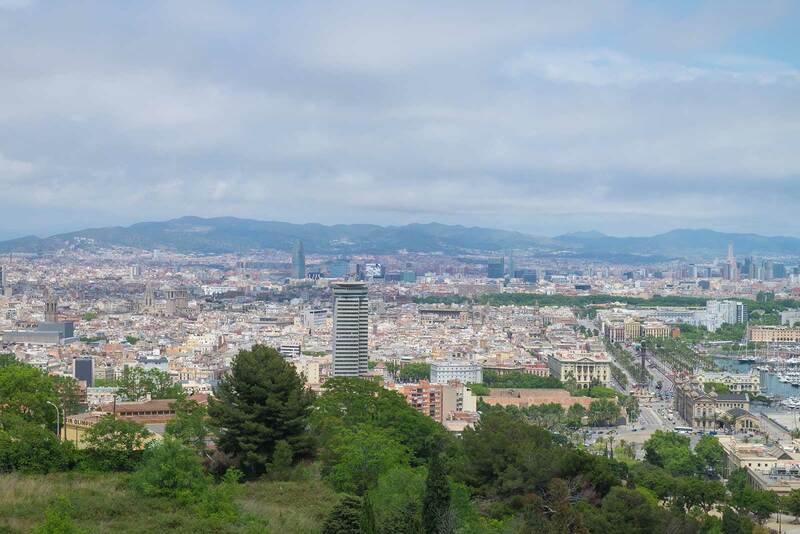 For some reason we hadn’t been up the mountain area of Montjuic last time so we took a cable car up to the top, dropping us off just by the castle. 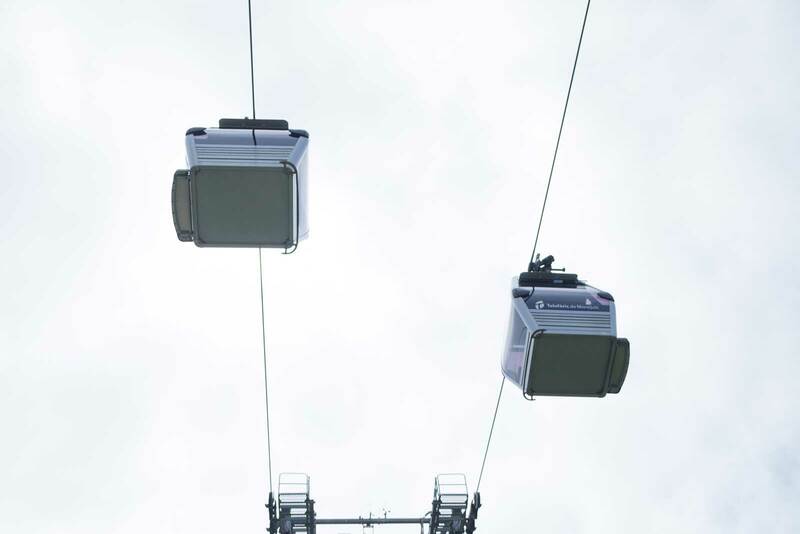 I think most of the tourists get a return ticket on the cable car as the rest of the mountain was so quiet! 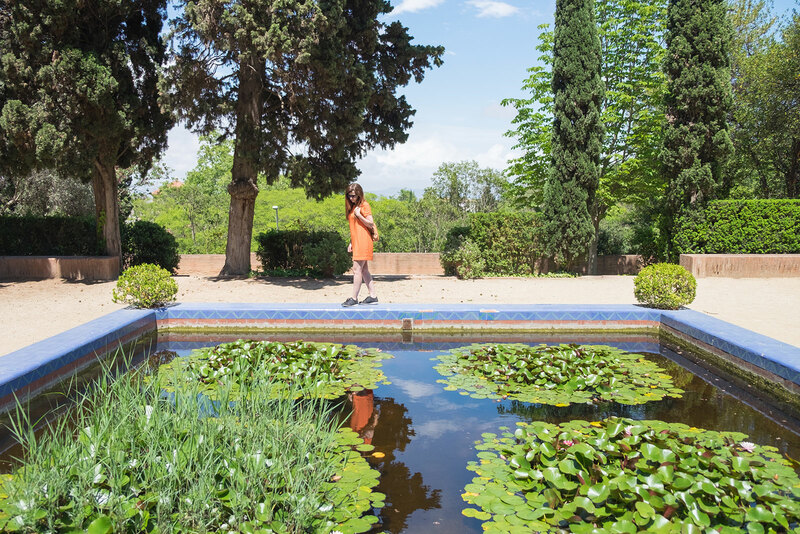 It was like our own secret botanical garden… beauts. 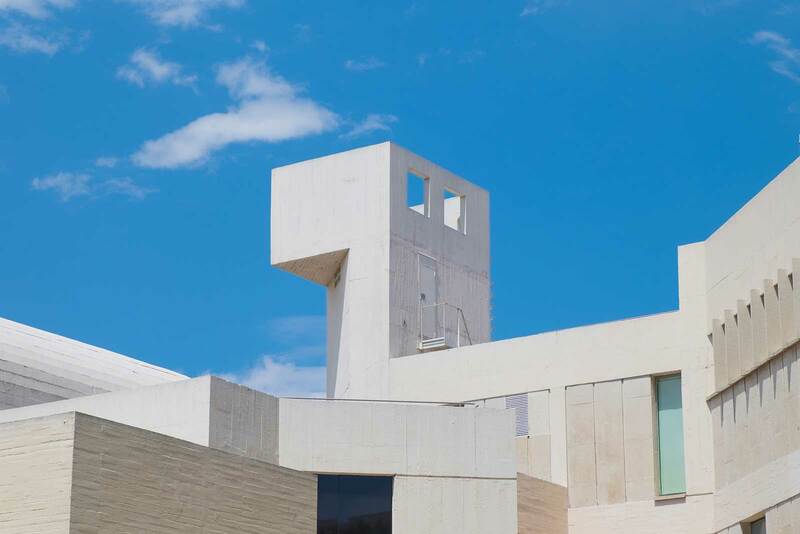 Among the woodlands in Montjuic is Fundació Joan Miró — a collection of works by the artist housed in a beautiful white washed building. 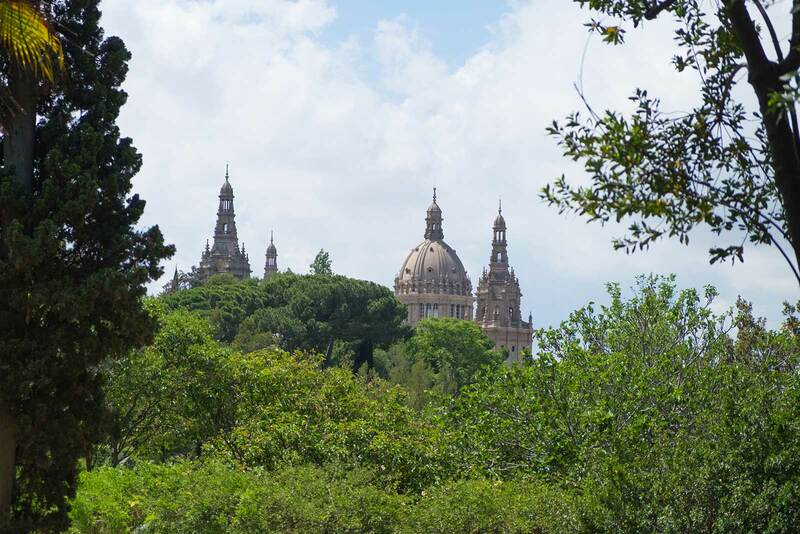 Strolling further down the mountain you can begin to see the domes of Palau Nacional through the treetops. So much to see up here, we didn’t even make it to the Olympic Park but the fresh air and views are marvellous. 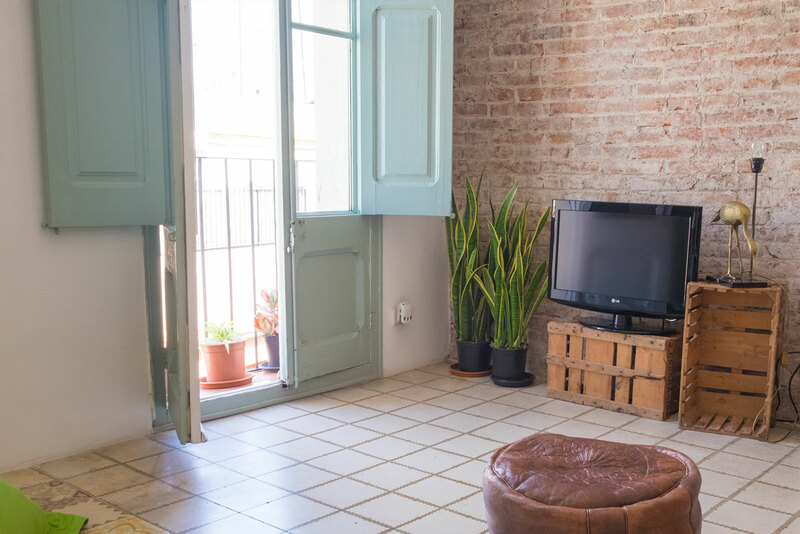 Another area we hadn’t explored before was Gracia, but I’d say it’s now one of our favourite places. 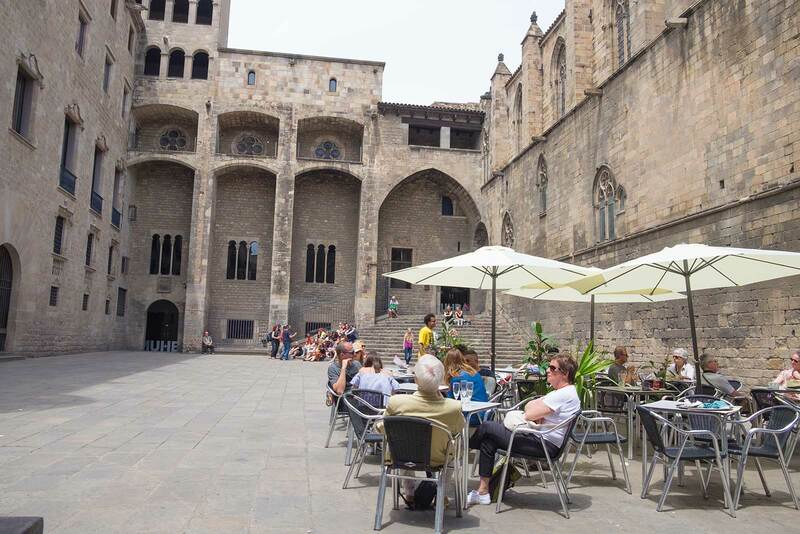 It’s a vibrant little area with charming squares and cafes. 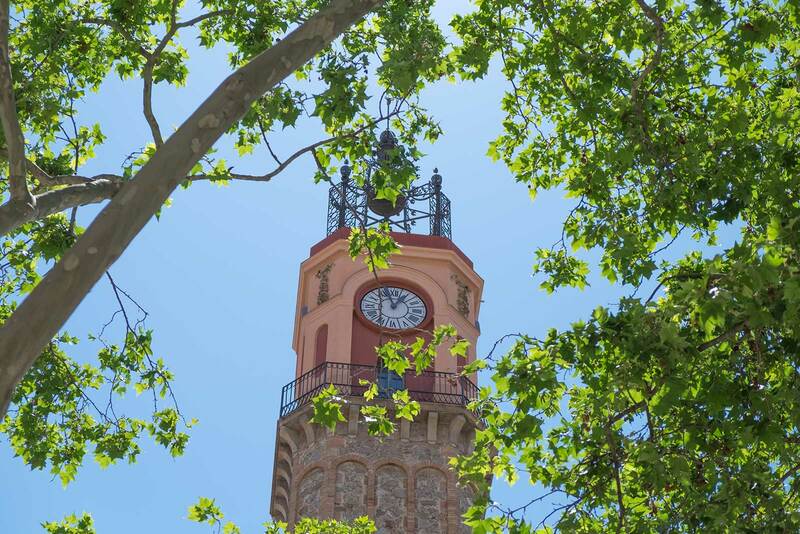 We ate lunch in one of the larger squares Place de la Vila, at Caduceus — a yummy mediterranean restaurant (which I won’t lie, I was drawn to because of it’s lovely branding and beautiful seafood illustrations on the front of the menus!!) Strolling around afterwards we were lucky enough to stumble across a swing class taking place in La Placa de la Virreina, apparently it happens on last Sunday of every month and the square fills with music, locals and dancing! The metro system is cheap and easy but it’s possible to walk everywhere and you see more! But of course go for some traditional tapas too! 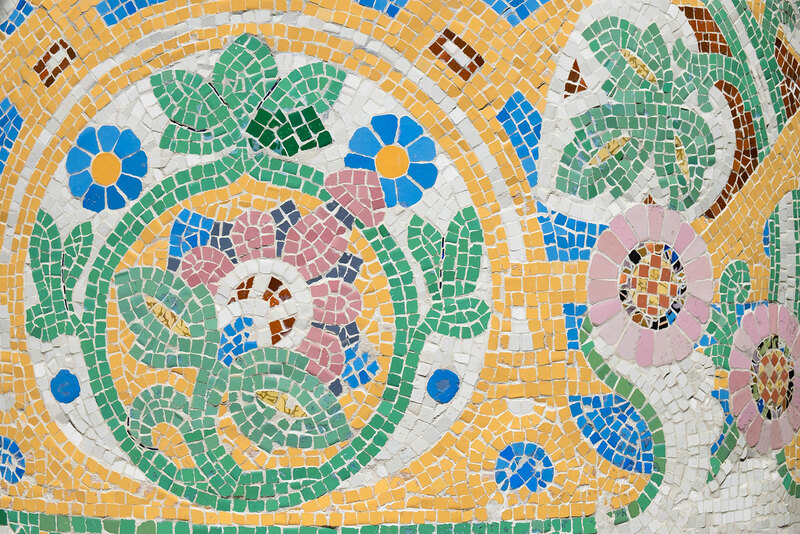 But if you head to Park Guell (we didn’t), go early to avoid the crowds! & for really good coffee head to Satan’s.